Παιδιά με μη ατοπικό (χωρίς αλλεργική προδιάθεση) άσθμα έχουν επιδείνωση των συμπτωμάτων τους έπειτα από έκθεση σε ενδοτοχίνη (ερεθιστική ουσία στους πνεύμονες), γεγονός που επιβάλλει τον έλεγχο της έκθεσής του με μέτρο πρόληψης στα σχολεία. BACKGROUND: Endotoxin exposure is associated with airway inflammation. Children spend 6 to 8 h/d in school, yet the effect of school-specific endotoxin exposure on asthma morbidity is not well understood. METHODS: In this longitudinal cohort study, 248 students with asthma, from 38 inner-city schools, underwent baseline phenotyping and follow-up. Clinical outcomes were evaluated throughout the academic school year and linked to classroom-specific dust and air endotoxin levels as well as home dust endotoxin levels. The primary outcome was maximum asthma symptom-days per 2-week period. RESULTS: Classrooms had higher settled dust endotoxin levels compared with homes (14.3 endotoxin unit/mg vs 11.3 endotoxin unit/mg; P = .02). Airborne endotoxin levels exceeding recommended occupational exposure limits for adults were recorded in 22.0% of classrooms. Classroom air endotoxin levels were independently associated with increased maximum symptom-days in children with nonatopic asthma, but not in those with atopic asthma (interaction P = .03). 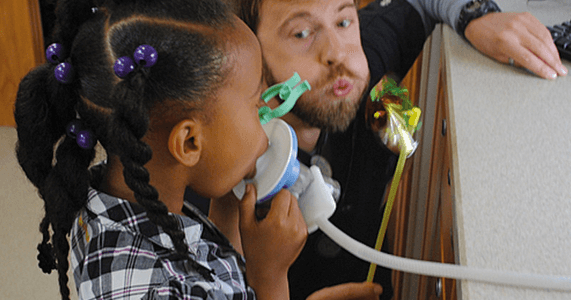 Adjusting for home exposures, classroom endotoxin exposure was independently associated with a dose-dependent increase in asthma symptom-days for children with nonatopic asthma (adjusted incidence rate ratio, 1.16 [95% CI, 1.03-1.31]; P = .02). In these subjects, maximum symptom-days increased by 1.3 days for each 14-day period when comparing students in classrooms with the lowest endotoxin levels compared with average measured levels. CONCLUSIONS: Inner-city children with asthma are exposed to high levels of airborne endotoxin at school, resulting in increased asthma symptoms in children with nonatopic asthma. Mitigation of school-related exposures may represent a strategy to decrease asthma morbidity in this population.